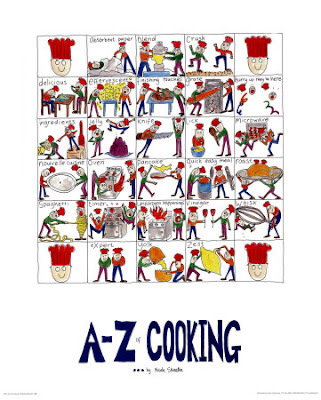 Labels: Chef's Vocabulary, Questions on cooking Posted by Yann_Chef on at 2:19 p.m. I cannot count the number of times that my friends and family rang me to ask what means a particular word used in a recipe that they found in a cooking book. This apply too, to restaurant menus. It is true that chefs use professional terminology without thinking that they are not talking to one of his/her colleague. So there is a list of culinary terms and their definitions. This list is a work in progress, so keep checking as I will be adding terms as they come to my attention. To arrange: Aesthetically place meat and garnish on the serving dish. To bard: Wrap in a thin layer or sheet of bacon or fatback bacon. To bind: Enhance the consistency of a soup, sauce or gravy by the addition of egg yolks, cream, flour, starch or blood. To blanch: Immerse certain foods in boiling water, either to part-cook them or to clean them. Either they are dropped into boiling water or put into cold water that is then brought to a boil. Bouquet garni: Choice of aromatic plants tied with some kitchen string. It usualy consists of 2-3 sprigs of parsley, a sprig of thyme, 1 or 2 bay leaves, some sage, celery or rosemay can also be used. The lot is wrapped in a couple of leaves of leek before tying it. To braise: Slowly cook meats or vegetables in a small quantity of aromatic liquid in a closed utensil. To bread: Roll in bread crumb. To brown in butter: Cook in butter until lightly colored. To brown on the top or gratiner: Put a dish, sauced or not, but often sprinkled with grated cheese, into the oven or under a broiler to obtain a light coloring and sometimes a crispy surface. A brunoise: very fine dices of vegetables or cooked meats. To butter: Grease a mold, a baking sheet, baking paper. Also means to finish a sauce by whisking in some fresh butter. Chaud-froid: means hot-cold, dish that has been prepared hot and served cold. Clarified butter: melted butter in which the whey and all the solid elements have been discarded to only leave the oil (pure fat). Such butter will resist better to high heat. It is used to prepare sauces such as the bearnaise sauce and hollandaise sauce. To coat: Cover with sauce. In confectionery, cover with icing or meringue. To color: Get a light golden color on all the faces of meats or vegetables in some fat. Compote: preparation of fresh or dried fruits slowly cooked in a light sweet stock. It also means vegetables (such has onions, red onions, etc) that are slowly cooked with stock and sugar. Confit: Slowly and gently cooked in fat. I'd like to make a point here, as at least 90% of my customers will ask for their duck confit crispy. It is not a roast but a parent cooking process to braising, therefor it cannot and should not be served crispy. To cook in a blanc: Cook vegetables (such as artichoke, Jerusalem artichokes, button mushrooms) or some offal (such as veal head, tongue or lamb feet) that are subjected to oxidation , in a water base in which lemon juice or vinegar and flour have been added. Note that the vegetables or meat are left to cool down in the cooking liquid. The proportion for a litre of cooking liquid is 25g flour, 1/2 lemon or 1 tablespoon of vinegar and 6g of salt. Cooking liquid: Any liquid that has been rendered after cooking food. For example, the liquid resulting from cooking mushrooms. Duxelle: Minced button mushrooms, shallots and onions sauteed in butter and slowly cooked until all the cooking liquid has evaporated. It is usually used as part of stuffings or dishes called "a la duxelle". The origin of the word seems to either come from a little village of Uzel in the Cotes d'Armor county of Brittany in France or La Varenne chef of the marquis of Uxelles. Emulsion: Mixture of two incompatible liquids with droplets of one liquid dispersed in a continuous phase of the other. Oil and vinegar in a dressing for example. The term comes from the Latin word for milk, which is just such a mixture. To deglaze: Dissolve, by moistening with little liquid, the caramelized juice at the bottom of a saucepan or roasting tray. To degrease: Remove all excess fat from stocks, cooking liquids, sauces, etc. To dilute: Add a liquid to thin out a sauce or a puree that is too thick; adjust consistency. Double-boiler or bain-marie: A bain-marie can be any set-up of utensils where the lower part is filled with simmering water and the upper part, which can be a pan or a bowl, is placed on the top. Allow 2 cm (3/4 inch) space between the two utensils. To glaze or glacer: In addition to the literal meaning of the word, this term applies to; first of all basting a cut of meat or other preparation with its own reduced juice and returning it to the oven to give it a glaze. Second meaning to this term is the formation on a sauced dish of a light, shining skin. Finally, in pastry making it means a layer of sugar spread over a pastry. A Julienne: Very thin batons of vegetables or cooked meat. To knead: to work a dough into a uniform mixture by pressing, folding, and stretching. To lard: Thread strips, lardons, of fatback bacon or bacon into a cut of meat with a larding needle (fig. 3). Lardon: Small dice of smoked or unsmoked pork belly. Liaison: French word meaning close connection, bond. It refers to the act of theckening and the agents of thickening. It was borrowed from the French by the English in the 17th only for its culinary meaning. It is only in the 19th century that the military and romantic liaison came to the English language. To line: Arrange slices of bacon, onion, carrot on the bottom and sides of a utensil. Also means, line a mold with dough. To line with aspic: Coat the insides of a mold with melted savoury jelly and allow it to harden before filling with the required ingredients. To marinate: Soak meat, game or fish in an acidic liquid either to flavor or to tenderize it. To melt: Cook thinly sliced, minced, julienned or diced vegetables gently in butter until they become translucent. A mirepoix: Rough dice of vegetables added to stocks or bouillon to flavor it. To moisten: Add the necessary cooking liquid. To poach: Simmer in a liquid kept just below point. Poaching liquid or bouillon: The liquid in which meat or poultry has been cooked. Pre-cooking rice: Put the rice you need in boiling salted-water for a few seconds; then drain in thoroughly and moisten it with milk. To purge: Put certain foods, such as brains, sweetbreads, kidneys, offal in general into cold water or milk to flush out impurities and traces of blood. Snails, cucumbers, gherkins, etc are purged with a coating of sea salt. To reduce: Simmer a liquid or sauce down to decrease its quantity and make it more concentrated. Be aware: Do not add any salt in this liquid before reducing it as the salt will concentrate thus making the final preparation too salty. To refresh: Blanched food is immediately plunged into ice-cold water to remove any foam and fix the chlorophyll in green vegetables. 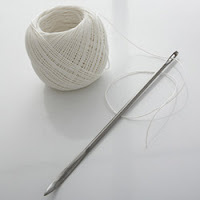 Ribbon (to make a.. ) : Consistency required in the making of sponge cake or sabayon sauce. It is obtained by long whisking of an egg and sugar mixture over low heat. The ribbon can be seen by lifting some of the mix and observe its behaviour when it falls on the rest of the mixture in the bowl. It should keep its shape while staying on the top of the rest of the mix see (fig.5). Roux: A mixture of flour and butter cooked more or less completely (white, golden or Dark) according to requirements. The usual proportion of flour to fat is 1/1 or 50g of flour for 50g of fat for a liter of liquid. To sauté: To fry quickly in a little hot fat. Sauté(adj) Quickly fried in a little hot fat. Salpicon: A mixture of several ingredients, cut to the same shape, generally in cubes, to garnish savory pastry shells, interiors of croquettes, rissoles, etc. Scant: Falling short of a specific measure: a scant cup of sugar. To score: Make some small incisions on the skin of meat or fish to help it to cook. To Seethe: Also written seeth. To decoct or prepare for food in hot liquid; to boil; as, to seethe flesh. To shrink: When cooking ingredients, having sweat off their moisture and juices, start to contract, they are said to shrink. To simmer: Boil very gently and regularly over low heat. To skim: Purify a sauce or soup over a very gentle heat, by removing the scum from the top. To soak: Applied to bread that must be soaked in soup for an extended period of time and reheated before serving. To stew: Cook almost without liquid or without liquid in a closed container. 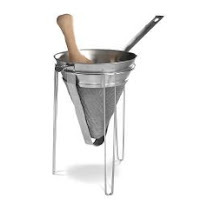 To strain: Cook in butter, then strain through a chinois, sieve, cloth or strainer stock, cooking liquid, sauces or force through a drum sieve purees, stuffing, etc. Consomme, syrups and fruit juices are strained through a muslin cloth. To stud: Inserting small pieces of fatback bacon near the surface of different cuts of meat, especially game to avoid that they dry out while cooking. To sweat off: To cook an ingredient covered over low heat to make it give up its juices. Tablespoon: In French cooking a tablespoon (not level) is equal to a soup spoon that holds about 15g (2/3 ounce) of flour or sugar and about 25% more liquid than the imperial tablespoon measure. To trim off: To make an ingredient more attractive by cutting away certain parts. For meat, removing excess fat. For potato, the eyes, etc. Trimmings: The off-cuts resulting from trimming an ingredient. To truss: To retain the shape of poultry, game, roasts, racks and seafood by tying it up with a fine cord, sometimes using needle (Fig. 4). 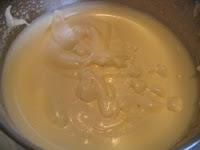 To whisk or whip: Give volume to a substance, such as egg whites, a sauce, cream, a hollandaise, etc. Great page, very helpful, but please change that light blue font, it is aweful on the eyes. Why do fish stock should not boil? What is the healthier way to cook meat?